Automation is widely used in the business world. Still, the concept of order processing automation remains a bit of an enigma - even among those who already know a thing or two about it. That's why it's critical to give yourself a refresher before driving the project forward and getting stakeholders on board. This eBook highlights the six key stakeholders in order management that need to be challenged to go beyond the status quo. Automation aligns with their priorities - it's your job to deliver that message. 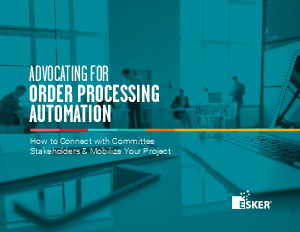 Download this eBook now to learn more about the key roles in an order processing automation project.